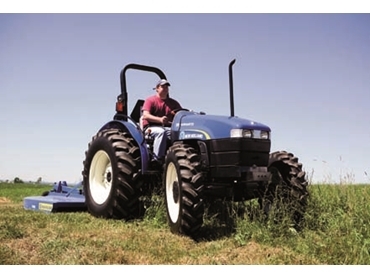 New Holland 's new Workmaster tractors are dependable, easy to operate workhorses. The 45-hp Workmaster 45 and 55-hp Workmaster 55 models are powered by efficient four cylinder engines. These are Tier III emissions compliant and they can run on diesel or B5 biodiesel fuel. In addition, these tractors are built for hard work hard. Big three-point hitch lift capacity (more than 1,430kg on the Workmaster 55) means the tractor can manage larger implements. Workmaster tractors have an 8 x 8 transmission with four constant mesh gears in two ranges. As such, they can deliver the right speed for all tasks, including mowing and loader work. The gears are set up in an H pattern and it is simple to swap between forward and reverse gears. A synchronized mechanical shuttle lever is located to the left of the steering wheel, so controlling the loader is simple. Controls are easily accessible next to the seat. Also, the bright, clear, analogue instrument gauges very readable. The suspension on the deluxe, contoured seat adjusts, making the tractors comfortable for the driver.